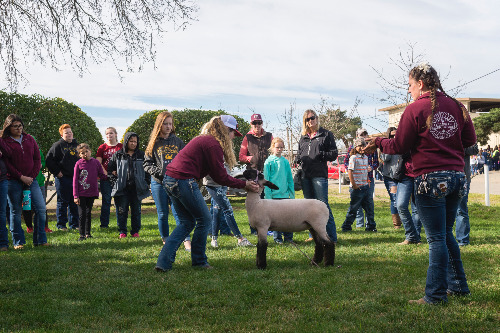 On January 21, 2019, the Chico State Sheep Unit held its first-ever “pen sale,” where 19 project lambs were offered for local youth to purchase. At the event, 15 families attended to learn how to handle and care for lambs directly from Chico State students before taking part in the sale. Each youth buyer put their name in a hat to determine the selection order, and lambs were sorted into three price ranges. The animals sold at the pen sale will be raised by local youth to be shown at Tehama, Silver Dollar, El Dorado County, and Dixon May fairs. Phillips said she enjoys the unique stories that often come from livestock sale. One of the sheep was purchased as a project lamb by a family hosting an exchange student from France. Another lamb is to be raised in El Dorado County as part of the “Steer for a Cause” program. This scholarship program donates the proceeds from the lamb when sold at auctions to the children’s hospital of the scholarship youth’s choice. The Sheep Unit Management Team facilitating the event included Iris Stewart, Megan Banwarth, Mikayla Duchi and Shelby DeVita. The team also features volunteers Allyah Perez, Martin Orduno, Cristina Ruiz and Kylie Chapton. Looking ahead, on Feb. 5 the sheep unit will hold the “Today Decides Tomorrow” Winter Show Lamb Sale, held online through Willoughby Sales, and the Annual Chico State Sheep Educational Day will be held on Feb. 9 at the University Farm. For more information, visit the Chico State Sheep Facebook page or contact Celina Phillips at crphillips1@csuchico.edu.